Thank you for joining me for Part 2 of our write off series! In our last article, we looked at The Single Biggest Mistake Entrepreneurs Make. If you haven't check out Part 1, you can do so right here. Let me first recap the definition of "write off". A "write off" is an expense that is applied against revenues that reduces the amount of profit made, and the amount of taxes that are paid. If you're not keeping your receipts, even for your smallest of purchases, then not only are you paying more tax, you’re losing money. As a long-time entrepreneur and Certified Professional Bookkeeper, I’ve seen it time and again. To demonstrate why you should be keeping those tiny slips of paper and what it will mean for your bottom line, let me tell you about two real-life clients I’ve had in the past. While I haven’t used their real names, their situations at tax time were all too real. Chloe, a massage therapist, had recently graduated from a local university. She made a living as a self-employed massage therapist for almost a year before coming to me with her tax return. In her first year of business, she’d made about $30,000. Not a lot, compared to some, but a wild success to others. Regardless, she’d earned every penny herself and was proud. Chloe was happy with her profits for the first year, until she saw the $5000 tax bill. When it came to massage, Chloe was a wiz, but not so with keeping the books. She never kept receipts. She didn’t know she could write off kilometers, her computer programs, new training, or appointment books. And she never thought to write off office supplies, because the purchases seemed few and far between, and she usually bought supplies along with her personal shopping. Without being able to properly identify her expenses, there was no way to improve her tax return. Chloe spent the money and threw away the receipts. Since she now had to pay the CRA almost $5000 for the previous year, as well as incurring taxes in her current year, the $30,000 profit from her first year suddenly didn’t seem like much at all. Had she not been putting anything into savings, her first year in business could have been her last. A successful dealer in antiques, Bob came to me because he felt he was paying too many taxes.It was an absolute mystery to him. According to his tax return he had made $300,000 in the previous year, but claimed he’d only withdrawn $60,000 from his business in cash to pay his bills. Obviously, the numbers were not aligned, so he sought to find out why he owed so much in tax. After looking at his books, we discovered that his expenses were not lined up with his income and he wasn't properly writing off inventory or expenses. Additionally, Bob was a frequent flyer. One of his reasons for starting the business was to earn enough to travel with his wife after the children flew the nest. He and his wife traveled often. When they did, Bob often went looking for antiques. He never considered them business trips, although he did business, because they combined business and pleasure. When I explained how he could write off many of the expenses associated with his trips, Bob learned how much needless tax he was paying. After showing Bob how he could capture write-offs and align his expenses, his taxable income was reduced to $97,000 for that year. This is why it is so incredibly important for you to understand what the magic of the write off. And why, when business owners don’t understand how they can capture that magic, it is the single biggest mistake they can make. Chloe and Bob are not alone. An accountant or tax preparer is going to give you some general guidance, but without knowing intimately how your business works, they will not be able to help you capture specifics for your business. When I looked at business taxes for a typical client's first year in business, about 95% of them were doing "write offs" incorrectly. So, how can I be sure I’m the other 5%? As promised in Part 1 of our Write-Off series, we offered you some freebies to help you with that! 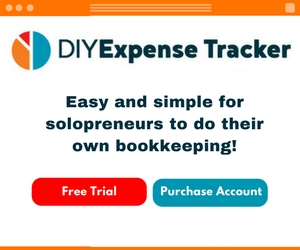 The first is a free trial of my DIY Expense Tracker. Click to learn more. The second is an invitation to join the Entrepreneurial Intelligence Facebook Group. Bring your questions about your write-offs, just in time for tax season! From March 15-31 2018, I’ll be encouraging questions in the Facebook group, to help you capture the right write-offs on your taxes. And one final tip: clearly pay your bills from the correct bank account (which was actually a huge problem for many of my Bookkeeping clients). You really need develop a detective-like ability to understand when you are spending money and how it applies to your business. Since you're here, take a look around the LynnWebb.ca website for more resources to help you develop your entrepreneurial intelligence. I'm looking forward to meeting you in the group!